Central Australians, don’t sell your house: For home-based power generation there is no better place in Australia than here. In Australia the vast majority of the population lives in the region with the least solar power (image at top). Less than 5% of Australia’s solar energy reaches its populated areas; 40% of Australia’s energy demand occurs during useful sun hours. This is likely to be a hot topic at the “Vision for Energy in Alice Springs” luncheon scheduled for Tuesday but postponed to November 1 because of a last minute cancellation of a Qantas flight. The function sponsored by Territory Generation (TGen) will hear from RePower Alice, who have told the Alice Springs News Online they will be sending several members to push for 100% renewable electricity generation by 2030, not just 50%, as planned by the NT Government. TGen’s CEO, Tim Duignan, gave the News a preview of some of the points he will be making. The lunch gathering will also hear from Mark Monaghan (Engineers Australia), Jamie DeBrenni (Regional Economic Development Committee), Jimmy Cocking (ALEC) and Paul Gleeson (Aurecon). TGen, like the other two in the troika supplying us with electricity, PowerWater (wires) and Jacana Energy (billing), is fully NT Government owned, “structurally separated” in July 2014, with the NT Treasurer being the sole shareholder. Mr Duignan says he “will outline TGen’s commitment to new energy, recognising the increasing importance of renewable energy across the Northern Territory, particularly in Central Australia”. TGen is the “custodian of $550m in assets,” he says. The $75m spent by the defeated Giles Government on new fossil fuelled generator engines (above, left) is likely to be front and centre of the discussion. The Territory is burning not a single lump of coal to produce electricity. In the four major population centres, for 30 years natural gas-fired power stations, using Territory produced gas, mainly from Palm Valley, west of Alice Springs, have been providing the power. There has been high diesel usage in remote locations. 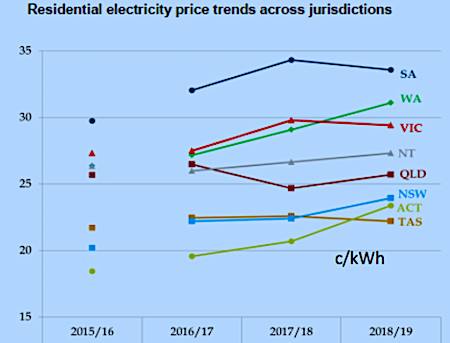 Wholesale electricity prices dropped and held, and retail prices are stable with tariffs in the NT dwelling pretty well in the nation’s mid-range (see graph). Gas sales are likely to drop. The Northern Gas Pipeline will export excess gas from the NT. “Assets” – including power stations – in various locations are reaching the end of their life. Around the nation, for years state governments have been acting independently within a national grid to which the NT is not connected. 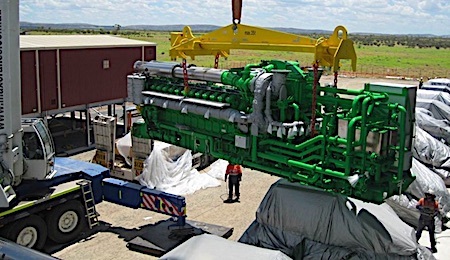 Darwin powers Katherine but Alice Springs power generation is a stand-alone operation. Eight out of the nation’s 14 most emission-intensive power stations have closed in past five years. All were coal-fired, headed by Port Augusta and Hazelwood. In SA Elon Musk is saying: “I’ll fix the energy crisis [by building a giant battery] in 100 days or its free.” In addition the SA Government is committing an additional $550m including $360m for a gas-fired power station. Alice Springs will soon be operating with a 5MW battery energy storage system which is one of the largest grid-connected solutions in Australia. Mr Duignan says a remote operating centre “will monitor and allow remote operations of the TGen asset fleet from one location, leading to increased efficiency, improved stability and faster response times”. That suggests (not quoting Mr Duignan here) operations by large companies with multi billion dollar transmission wires and batteries. However, the buzzword now increasingly is community generating, household and neighbourhood based, while the big operators and their big systems are accused of fleecing consumers and have plunged the Turnbull Government into crisis (even if hoping for a breakthrough with the “National Energy Guarantee”). All images courtesy TGen. BELOW: A sample of recent power generation in Alice Springs. Not many people seem to have noticed the bank of invertors outside the big green shed on the main North road, or the solar array South of Coober Pedy, or the community grid going in at Goulburn, NSW, ($500 membership ) or the facility in Morocco based on solar and molten salt, and supplying power 24/7 to two million people, or the same facility in Spain doing much the same thing, or the shopping centers at Griffith or Murray Bridge, which have gone off grid. All done by an Australian company. Of the 50 or so mini grids in Australia, many are facilitated by a major development company – Lend Lease. One in WA supplies 20 houses from a battery bank inside a shipping container, while the money for the Morocco unit came from Wall St, where they know a thing or two about money. We could have been exporting electricity to the Eastern states but for the breathlessly short sighted vision. It’s no coincidence that the facility in SA (Elon Musk) is situated right next to the interstate connector. And what of the electric cars that will be heading our way? Holland or Denmark runs its entire rail system on wind. Where have we been? No. Just … no. SA hit their 50% renewable target this year (eight years earlier than expected), leading Australia in renewable generation and leading the world in electricity prices. That’s right, SA now has the highest electricty prices in the WORLD. But it must a coincidence, because sun and wind are FREE … right? Meanwhile, what would we do with our $75m gas upgrade? Sell it to WA? Come on. Why would toss away such a big investment, especially when the gas is right here in the NT? And where is the money for 100% renewables going to come from? The NT is already an economic basket case! I say we go back to steam power. We have a huge surplus of hot air that is added to every time these RePower ideologues get on the podium.